Having given a talk in autumn 2011 about the inspirations for his work, Borin Van Loon finally decided to record those parts of his early paintings and collage which survive and place a selection on this website. 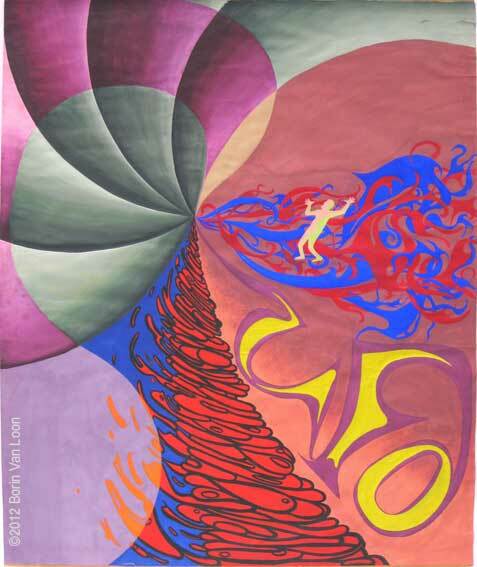 Having made a sequence of posters for school social and cultural events, he wanted to stretch things further and try his hand at large-scale work influenced by the psychedelic posters of the time and the surrealist paintings seen in the Tate Gallery, Millbank, London. This is clearly heavily influenced by the 1960s work of Victor Moscoso which depends on poster production techniques of the time (not to mention brilliant desing sensibility!). Unfortunately, Borin didn't know anything about hand-separations of black and white artwork, over-printing and darkroom techniques, so he tried to achieve something similar with cakes of poster colour on sugar paper 'borrowed' from the art cupboard at school. 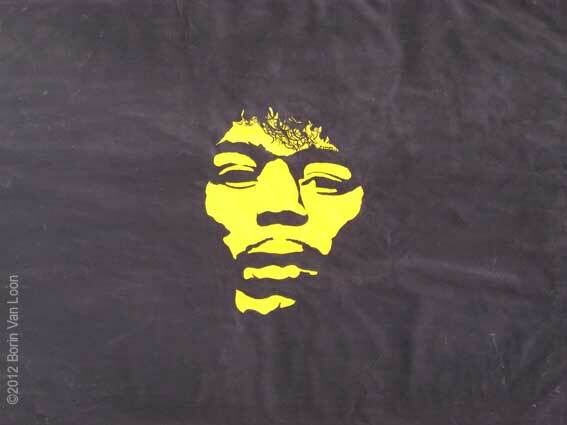 One of the first stand-alone paintings by Borin Van Loon, inspired by the cover of the LP Axis: bold as love by The Jimi Hendrix Experience. Many things have been inspired by the music on that album and its outside, inside and insert artwork (see the 2012 painting Axis, for example, which reflects the colour scheme of the lyric sheet). Hendrix was breaking in the London clubs with The Experience, scaring the pants off the local guitar-slingers such as Jeff Beck, Eric Clapton and Pete Townshend. His features lent themselves to striking graphic depiction, deliberately set in a large black ground. Little did we know that, once unleashed on his homeland in the Americas, his days would be numbered. 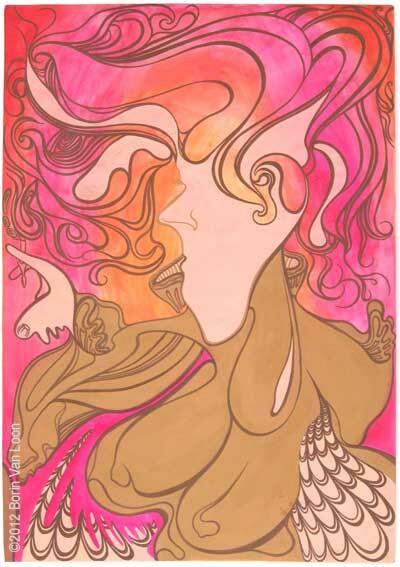 Another attempt to depict the split inking and colour gradation of the psychedelic poster explosion. UFO was the unoffical HQ of the freaks which was held in a subterranean club in the West End. Mick Farren worked on the door and it was managed by the influential figure Joe Boyd. 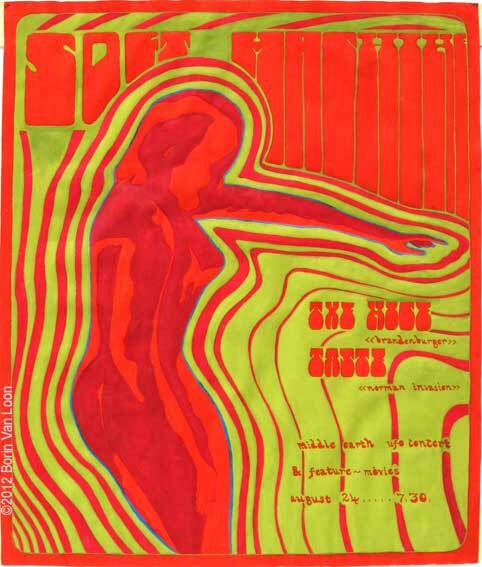 Soft Machine and Pink Floyd were the 'house bands'. See Hapshash & The Coloured Coat for a seminal UFO poster. Sticking bits of paper on other bits of paper became an interest at a time when top quality design and imagery started to arrive through the parent's front door for free in the form of Sunday colour supplements. 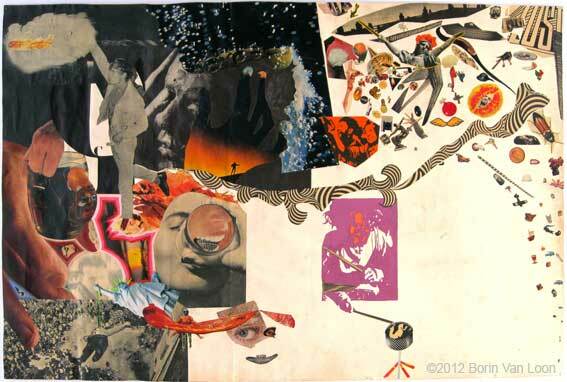 Opening up new ways of exploring imagery, design and text, sometimes incorporating paint, the early collages tend to have an "everything but the kitchen sink" character but with some sense of free-ranging control. See also Behold Your King from this period which prefigures the Facial Make-ups sequence of collages. A watercolour painting from a little later and still stuck on those arabesques. Paul Klee once described taking a line for a walk; Borin is sure that he didn't mean this sort of thing, but that's what it felt like in creating this piece. Sigmund Freud was claimed (whether he liked it or not) as a major influence by the Paris Surrealist group. Having read a series of Freud's introductory lectures on psychoanalysis and dream interpretation, Borin started to look at his own dream imagery. 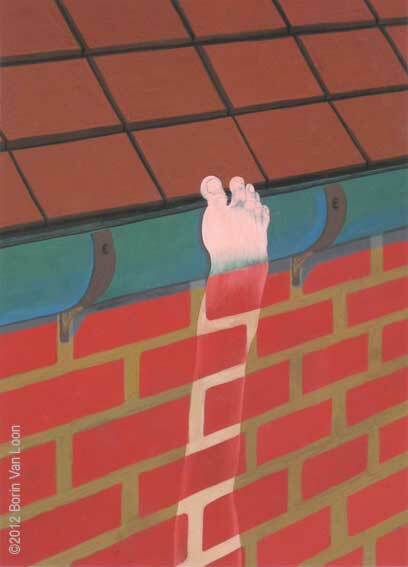 This watercolour painting summarises a vertiginous falling nightmare. Two early attempts to get to grips with oil paint. See also the Captain Beefheart portrait: The propensity of the English for queuing. The inspiration here was a gravestone found in the churchyard of Leiston, Suffolk. The detail of the lettering and algae (shown in close-up to the right above) are reasonably accurate and the sepia picture of soldiery was found at the bottom of an old box. See our sister site The Ipswich Historic Lettering website for an image of the actual gravestone. Clumsily punning title, but you get the idea. 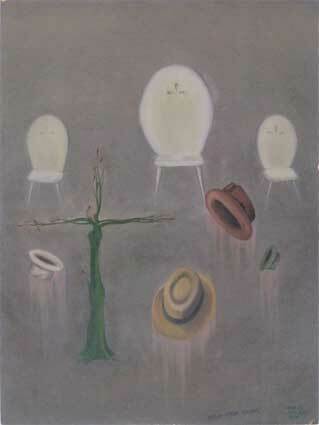 The trilby hats flying upwards, ghostly chairs and tree figure represent a faltering first step towards later oil paintings. See also some of the inspirations for this early work.